Fox News Covers Protest In Washington DC. Amos and Andy in ~ Black Responsibility. Abortion Causing 'Black Genocide,' Activists Say (CNSNews.com). Center For Disease Control Report On Black Abortions. Atlanta Post Drills Pastor Childress on Billboard Campaign. Black Leadership Owes Don Imus An Apology. The Complete Story on Barack Obama. Abortion Industry Decimating Black Community. Black Pro-Life Advocates Plan Massive Abortion Protest Outside NAACP. When is a racist a racist? The Best Thing to Happen to End Blackgenocide. "Several years ago, when 17,000 aborted babies were found in a dumpster outside a pathology laboratory in Los, Angeles, California, some 12-15,000 were observed to be black." Minority women constitute only about 13% of the female population (age 15-44) in the United States, but they underwent approximately 36% of the abortions. On average, 1,876 black babies are aborted every day in the United States. This incidence of abortion has resulted in a tremendous loss of life. 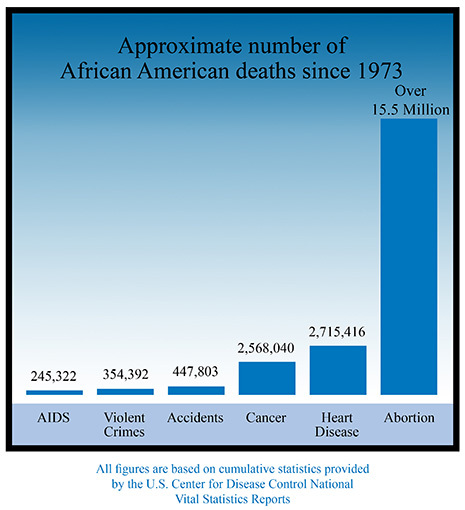 It has been estimated that since 1973 Black women have had about 16 million abortions. Michael Novak had calculated "Since the number of current living Blacks (in the U.S.) is 36 million, the missing 16 million represents an enormous loss, for without abortion, America's Black community would now number 52 million persons. It would be 36 percent larger than it is. Abortion has swept through the Black community like a scythe, cutting down every fourth member." A highly significant 1993 Howard University study showed that African American women over age 50 were 4.7 times more likely to get breast cancer if they had had any abortions compared to women who had not had any abortions.